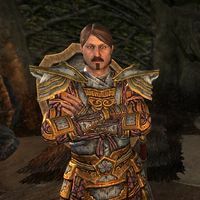 General Flaminius Auctor is an Imperial member of the Fighters Guild and the Province General of Cyrodiil. With the Worm Cult in power and the province in a state of war, his position is largely titular. He can be found with the other Council‎ members at Vulkwasten, Sentinel or Fort Amol during the quest Proving the Deed. General Flaminius Auctor can be found with the rest of the Fighter's Guild council, waiting for evidence linking to Jofnir's killer. "By the Divines, it's good to see you here." "Flaminius Auctor, Province General of Cyrodiil, at your service. I've long had the privilege and honor of being the guild's arm at the heart of the Empire. How I wish that was still the case." "I'm sure you heard of the unrest in Cyrodiil. Three banners set upon the other, the sacking of the Imperial City, the death of the Imperial line...my time with the guild has not been quiet." "I hope you've come bearing good news, comrade." "My homeland ablaze, and the guild split asunder. I never thought I'd live to see the day." He was featured as an author on the Loremaster's Archive. This page was last modified on 30 July 2018, at 12:06.